Gearing up for the release of their new film Integrity <廉政風雲 煙幕>, Nick Cheung (張家輝) and Sean Lau (劉青雲) spoke about their roles in the movie, as well as their perspectives on working with new actors. Nick believes opportunities need to be offered to a new generation of actors, and wants to work with them to help improve their acting. Integrity revolves around the ICAC investigating a cigarette smuggling case. Nick portrays a widower and an important witness to the case, while Sean portray as an ICAC Investigator. The cast also includes Michelle Wai (衛詩雅), Kathy Yuen (湯怡) and Karena Lam (林嘉欣), who will play as Sean’s wife and subordinate. The two share a very poor martial relationship, a condition where they’re on the verge of separation. But troubled marriage aside, they work together to solve the case. When Nick suddenly disappears when he’s supposed to appear as a witness before court, Sean sends Karena to Australia to find and persuade him to return to Hong Kong. 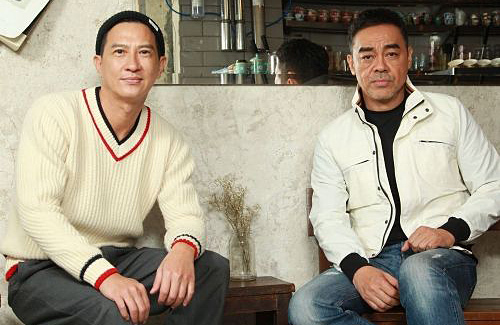 Many people feel that the top stars in the Hong Kong film industry are aging, yet there is a lack of succession of younger talent. Since Nick is also a film director, he shares his perspective in the cultivation of new actors, “I really want to work with new actors. This is a mission for me. Right now, the new generation lacks opportunities. If I have the chance and the capability, then I want to give new actors the opportunity to act. I will not make them guest in it or tell them to be some random worker, because there’s no point in that. Instead, I will give them scenes to act, train them and offer them an opportunity. If they are hard-working, it is possible to make a name of themselves through the opportunity. It is up to their responsibility to make it work.” However, this does not mean he’ll cast them in lead roles right away, because even if he does, the investor won’t agree to it. If he were directing the film, he would try to give them more screen time so they’re more visible. Although a multi-award winning actor, Sean revealed that he rarely watches his own performances. The 54-year-old actor said, “Many people said that an actor has to be very immersed in his role. But people don’t understand that if you’re too immersed, you’ll portray it incorrectly. You have to be able to assess whether an incident affects you or your character. If your own feelings are too deeply immersed, than you’ll lose your logical judgement. You’ll just follow your own emotions, but this doesn’t mean you’re portraying the character correctly. Whether your acting is spot on or not depends on the director, since actors just satisfy the director’s requests. “Emotions are not for you to create. If other people think your acting is good, it doesn’t matter if you’re immersed in the character or not. Don’t waste time trying to act like an actor. Just do what an actor is supposed to do,” Sean concluded to the agreement of Nick.